Affordable and obtainable 14 inch round ceiling diffuser in white. 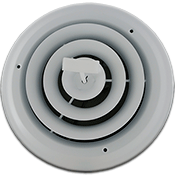 This round ceiling vent comes with a steel butterfly damper to control air volume from the register. The all steel construction and white enamel coating ensures this round diffuser is durable enough to use in the ceiling and the wall. Replace your current outdated and damaged round diffusers with this clean and attractive 14 inch round ceiling diffuser. 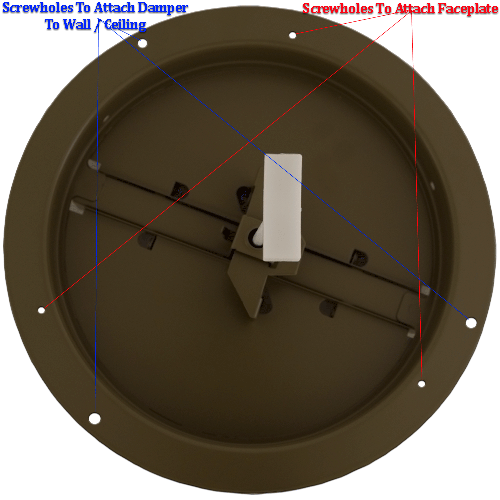 Overall round diffuser faceplate size of 17 15/16"
Why is there 2 sets of holes on the damper? Hover over or click on the image below to see a explanation. 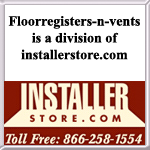 Tip: To order your round ceiling vents correctly, you must measure your hole opening in the ceiling. For example, this 14 inch round ceiling diffuser is made for a 14 inch diameter hole in the wall or ceiling. Don't need a damper to control airflow? Check out the 14 inch round ceiling grille.